A charming township in Salem County, Elsinboro is a tiny town but swells with pride in its neighborhoods. 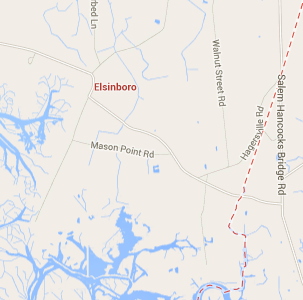 It borders the Delaware Bay with first mentions of Elsinboro dating way back to 1701. Today, it still remains a beautiful place to live and work. We want to help you keep it that way.Here at Homecraft® Inc., our reputation for quality roofing, siding and other home improvement work precedes us, and we’re proud of that. As the local front runners in roofing, siding, gutters, doors, and replacement windows, you can rest assured we give you the best materials and top-notch products. You also get treated to personalized attention by our dependable, reliable, dedicated and friendly contractors who are committed to 100 percent customer satisfaction with more than 30 years of experience. Windows are creative ways to elevate the look of your home while cutting back on monthly energy usage and costs. Our replacement windows come with the widest selection and highest quality available. Whether you choose our own Homecraft® vinyl replacement windows, or our Andersen® wood replacement windows, you will be treated to superior performance. Hands down, we are your #1 door company in the area, with experts who can create a brand new entryway with weather-resistant storm doors to protect your home at an affordable price. We can install a beautifully crafted front entry door for your home, or perhaps replace an old patio door or sliding door. The possibilities are endless! Unlike lots of other siding contractors who claim to give you options, we really do. With a wide variety of siding materials, textures, styles and colors at your fingertips, we give you the best value around. It’s easy: browse through our inventory to choose the traditional look of cedar shake siding to match the look and décor of your home. For the ultimate in roof repairs and new roofing in Elsinboro, partner with our GAF MasterElite™ roofing contractors to install high-quality roofs predicated by expert installation. Our “Golden Pledge™” warranty protection is the foundation of our company because we stand behind the products we sell. Gutters from Homecraft® Inc. are will properly divert the flow of water off your roof and away from your home to avoid pooling at the foundation. It’s our mission to keep your home safe from water damage, which is why you need Homecraft® Inc. to install your next gutter system. We can do it all, making smart home improvements for your peace of mind. Your home is your biggest investment, so invite our skilled and experienced team of professionals to install the highest quality roof possible. From top to bottom, Homecraft® Inc. can make your ideas and designs come to life with the very best in installation. FREE Estimates on Elsinboro NJ Home Improvement, Windows, Doors, Siding or Roofing. Call Homecraft®, Inc., today at 1-877-494-0377 to schedule a FREE in-home consultation and estimate for your Elsinboro NJ home improvement project, roofing, siding, replacement windows, doors, or gutters.